known to be one of the most prominent temples in Bharatpur. Almost 400 years old, this temple stands right in the middle of the main market area. It is said to have been established by Naaga Baba, a sage who worked for upliftment of the mankind. Displaying typical Rajasthan style of architecture, this beautiful temple is visited by a large number of devotees every year. 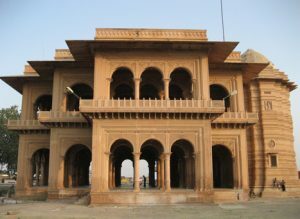 In the neighborhood of this temple is another Laxman Temple, which was built by Maharaja Baldev Singh in 1870. Made up of sandstone and white marble, this Laxman Temple is home to Ashtdhaatu idols of Laxmanji and Urmilaji. Smaller Ashtdhaatu idols of Ram, Bharat, Shtrughan and Hanuman are also enshrined in this temple. Both the temples can be easily reached from anywhere in the city by a cab, a cycle rickshaw or a tonga.